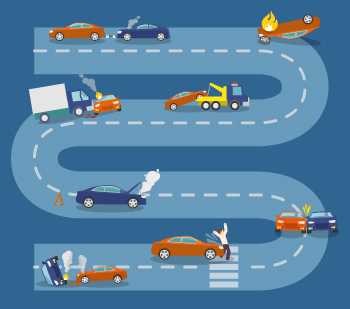 Home | Blog | How and Why Do Pennsylvanians Crash? From 2009 to 2014, there were nearly 110,000 crashes in the following midstate counties: Adams, Dauphin, Cumberland, Lancaster, York, Lebanon and Perry. In fact, Pennsylvania State Police said about 90 percent of vehicle collisions are a result of human error, primarily aggressive driving, distracted driving and driving while impaired. The good news about these statistics is that drivers have the “opportunity to change their behavior and help cut down on the number of crashes in their communities,” according to Pennsylvania State Police Trooper Rob Hicks. Also good news is that, while some midstate roads are more dangerous than others, most accidents did not occur because of the roads themselves, according to the PennLive / The Patriot-News and WGAL News 8 report. In York County, a curve on Concord Road in Springettsbury Township (near the York County Prison) is among those most prone for crashes. In Lancaster County, two roads with tricky S-curves are among the most dangerous – Hempland Road in West Hempfield Township and Reinholds Road in East Cocalico Township. How Can You Become a Safer Driver? PennDOT has taken several measures to encourage safety, from implementing infrastructure improvements to promoting behavioral programs, such as impaired and distracted-driving campaigns, aggressive-driving enforcement and seat-belt and child-restraint programs. Through these efforts, PennDOT aims to reduce crash fatalities from 1,413 in 2010 to 706 by 2030. Check out PennDOT’s Just Drive PA website to learn more about the programs and resources it offers, including this safe driver quiz. The End Distracted Driving site offers resources specific to distracted driving for both adults and teens, including a Family Safe Driving Agreement. By signing the agreement, families pledge to not only drive without sending or receiving text messages, but also to not drive while eating, applying makeup or changing CDs. Passengers are challenged as well, to offer help to the driver is not distracted. If you or someone you know has been involved in a crash, call on the KBG team for help. We’re here 24/7 to get the Results You Deserve®.